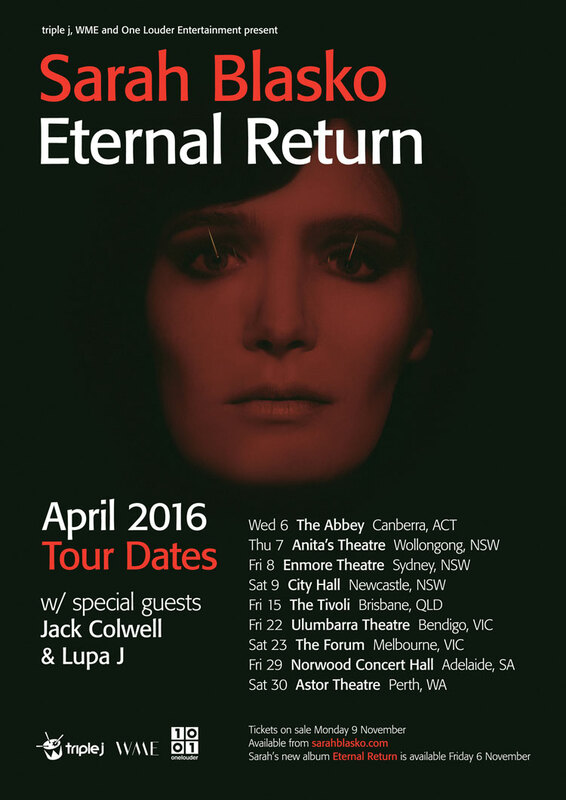 Eternal Return, Sarah Blasko’s fifth studio album is set for release on Friday, November 6. Her first since 2012’s I Awake, this one takes a different direction from the haunting strings of its predecessor and possesses a more upbeat, synth pop vibe. From the opening fanfare of the first track, ‘I Am Ready’, through to the powerful Kate Bush-esque vocals on the final ‘Without’, Eternal Return is uplifting and optimistic. Sarah agrees that it is a different direction for her and enjoyed the entire process of writing and recording this new venture. “At the heart of the record is a love record, but there are other things either side of that. I think it is that kind of record [uplifting and optimistic]. It’s not to say that the process of making it was like that the whole time,” she laughs. Replacing the layers of strings for layers of keys, Sarah says Eternal Return came about after the purchase of a new instrument. “It all started with this new keyboard I bought. Quite a lot of the sounds were from that keyboard and co-writing with other people. I sat down and tried to write it in the same way I had the last one and I realised it was sounding the same,” she says. It is “synthy”, but it is also candidly honest, lyrically, which Sarah says is just the way she is. “I’m pretty open, as a person, with my feelings, I guess, so it translates quite easily being open with music. It’s just something that you feel you need to do, or that’s satisfying to do. I don’t really think about it until someone asks me!” she laughs. Track two, ‘I Wanna Be Your Man’, is a frank, yet tongue in cheek, comment on being a woman, not just in music, but also in everyday life. While it’s not a protest song, it reveals a frustration that there is still a gap between the genders, and she just wants to be equal. “My experience from time to time – not specifically in the field of music, also in the world in general – has had this feeling of being quite exposed as a woman in a circumstance of working with men, and you just wish you could be perceived in a way that guys perceive other guys,” she says. “Sometimes when I do interviews, there are some questions that, there’s just no way someone would ask a man. It’s not something I go around incredibly angry about, and I wouldn’t want the song to come across that way, but it’s more about that feeling of wanting to be equal and to go under the radar. Collaborating with her friends Ben Fletcher, David Hunt and Nick Wales on Eternal Return, Sarah says were some of the best partnerships of her career thus far. “When you write with somebody, it can be very intimate so you have to be comfortable with them. Well, you don’t have to be comfortable with them, but it certainly brings out something great when you are comfortable with each other,” she says. Although the album drops this week, Sarah says the tour won’t happen until the new year, but she’ll be bringing a new band. “I won’t do a tour until early next year. I’ve got a whole new band, except for one member. That’s mostly because the guys are travelling around doing other things. Because there’s so many layers of keyboards on the album, we actually needed three keyboard players as well as a bass player and drummer,” she says. Eternal Return is available for your ears’ pleasure on Friday, November 6, thanks to EMI. Sarah Blasko will tour the nation next April, playing the Norwood Concert Hall on Friday 29th April. Tickets go on sale Monday November 9th at 9am. Posted in Music, What's on in Adelaide and tagged Eternal Return, interview, Norwood Concert Hall, Sarah Blasko, What's on in Adelaide. Bookmark the permalink.